To investigate reported recent occurrences with the hope of recording the phenomena on our equipment and also to provide as much information as possible to the venue owner. The team was invited to investigate this property when the venue owner contacted Ghost Connections. The team visited before the investigation to discuss the occurrences with the venue owner as well as the format for the investigation. This property is a large, late 19th Century Victorian house. The occurrences described to the team were those of a man repeatedly being seen at night in the doorway of one of the children’s rooms. There have also been sightings of people on the stairs. Also a child of the family was playing the piano in the lounge one Sunday when she was told several times to "Shhh" so she stopped only to find there was no one with her. The dinning room has been described as "atmospheric" and a visitor once described it as "a busy room", which was thought to be an odd description. After our meeting the venue owner was happy with the approach we had described and we were itching to return for the investigation. 2 x Monitors, remote IR camera and VCR recording equipment. GCUK's normal approach to investigations is purely from a scientific point of view. We were to spend the night as we normally do by conducting vigils and "calling" for potential spirit activity and trying to provoke what could be termed a "paranormal" response that could be recorded. We also decided on the night that the dinning room provided a good location to carry out a "spiritual experiment" in the form of a séance, which might also help to cause some results. We chose to set up CCTV to run throughout the investigation in two locations mentioned by the owner, being the lounge and the bedroom. 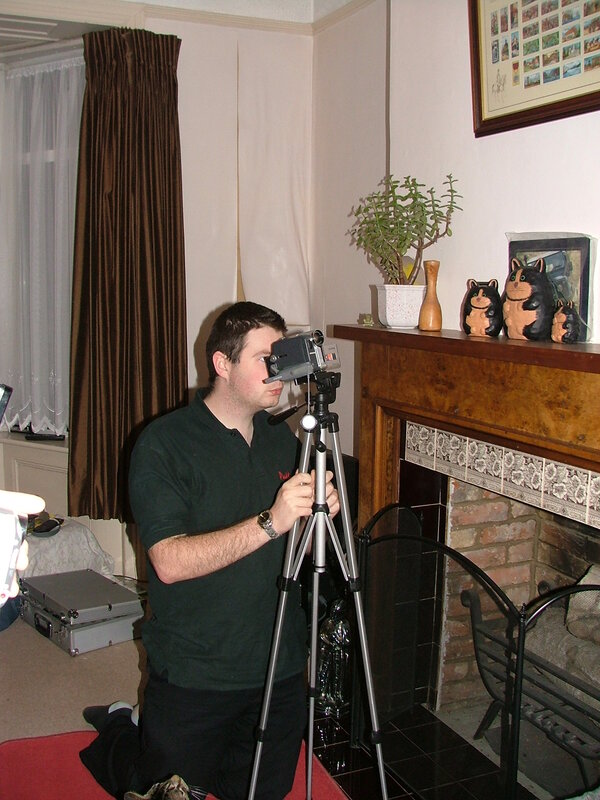 Camcorders were to be used in addition to these to film our team from all angles while we moved the investigation around the house. Three separate digital voice recorders were to he running throughout the investigation. 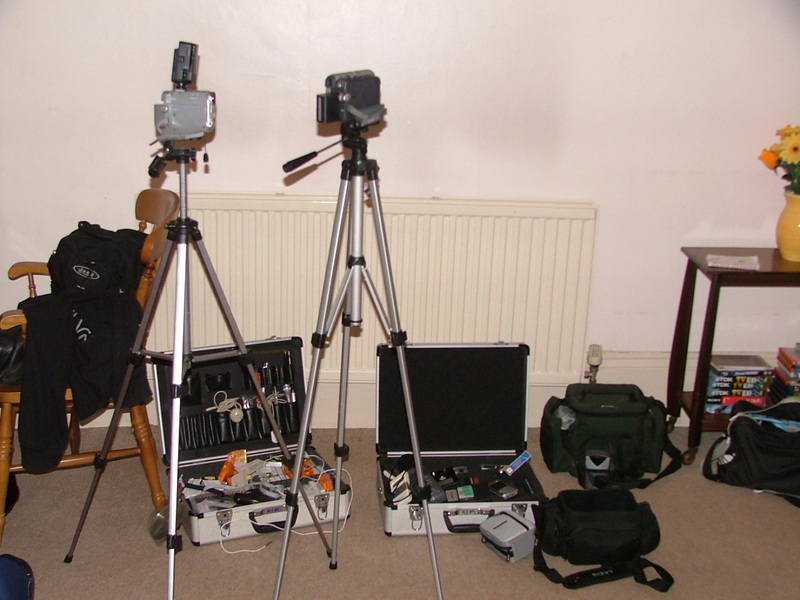 Hopefully by using our equipment we hoped to capture some results either photographically or on audio or video media. We arrived at the house at 9.00pm and toured the house to see the locations we would be working in. 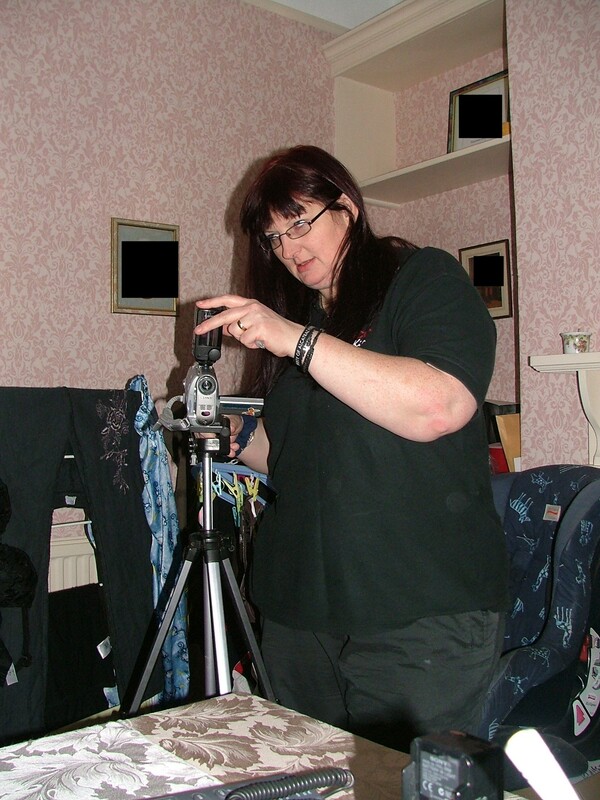 We then proceeded to set the CCTV equipment up in the lounge and bedroom as well as Kim’s camcorder on a tripod pointing up the first flight of the staircase. Then came some baseline readings for EMF and temperature in the areas we were going to investigate and monitor being the lounge (19.5C) (EMF 0.0mg), dinning room (19.2C) (EMF 0.0mg), stair case (18.7C) (EMF 0.1mg) and bedroom (19.2C) (EMF 0.1mg). 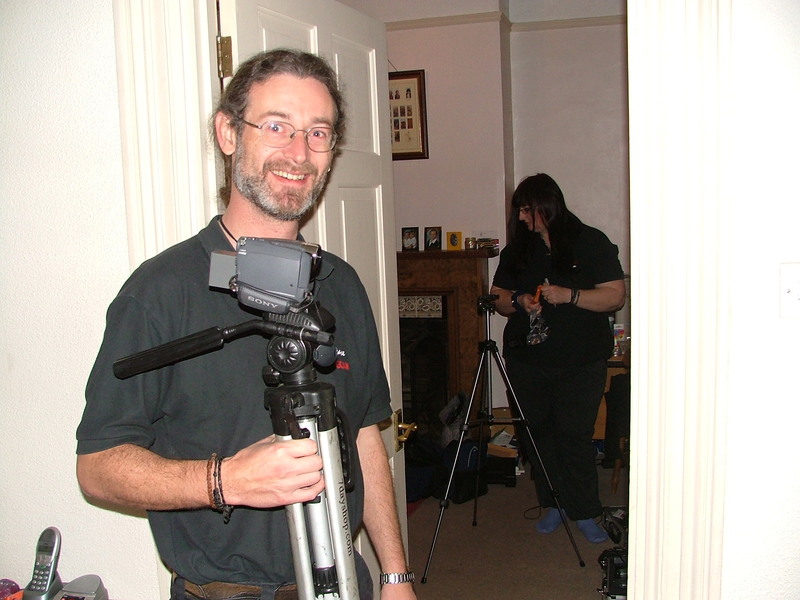 At 10.00pm we were ready to start the investigation with a vigil in the lounge, Dave and Paddy's camcorders were used on tripods to film the session. Ian was sat in an armchair by the piano, Dave and Kim on the sofa towards the front of the room, Paddy on the floor by the door and the venue owner and friend on the sofa half way down. After a period of silence settling into our surroundings Dave started calling for activity. During the first half of this session Kim felt some pressure on the back of her head and both she and Dave felt couple of draughts across their arms and Kim also felt a touch to her head at one point. Ian felt a sharp poke just behind his right shoulder blade and had been experiencing slight 'touches' along his right hand side for a while. He was very conscious of the area to his right, which from where he was sitting, was towards the rear of the lounge near the piano. He had possibly at one point even heard a shuffle from this area. On more than one occasion we all heard a movement coming from the hallway behind the door where Paddy was sitting on the floor. At 10.50pm we stopped calling for spirit as there seemed to be little or no response, and decided to switch the session into more of a formal séance, to see if varying our approach would vary the results. Again with Dave leading we asked for some activity and was rewarded by a series of knocks and taps from both the front and rear of the room. Some of these we are certain were the radiators cooling, floorboards or even the TV cooling, but a couple of these knocks did appear to be stronger than the others and the timing suggested a response to the questions being asked. We ended this session at 11.35pm and had a break. We spent the break discussing the evening so far with the venue owner and friend before deciding to go to the dinning room to carry out our "spiritual experiment". It was 12.15am and the four members of the team, venue owner and guest all took part in a linked hand séance around the dinning table. There were a few knocks or taps heard, and Ian felt a few prods into his right hip, and a more prominent jab against the left side of his head. This session ended at 1.15am when we had another break before reconvening in the bedroom for another vigil at 1.45am. This was just the team and venue owner as his guest decided to sit out the rest of the investigation. Both Ian and Dave called for spirit activity but nothing occurred. At one point Kim felt her head was being tickled, Ian had a slight head ache that passed and they both smelt a musty old smell for a few seconds that disappeared. Given that both the team and host were tiring at this point, and that we had covered the three main areas we wanted to investigate we decided to end our vigil and the investigation at 2.35am, and after a half hour of collecting our equipment, left the venue around 3.00am. Unfortunately we were not able to capture any of the reported phenomena on our equipment so are unable to drawer any conclusions at this time. However, there this house is certainly atmospheric suggesting that there is something to the occurrences that have been reported. The noises heard in the lounge and dinning room could easily have been naturally occurring so cannot be classed paranormal. Not disappointed by the nights results we were still very happy to have been invited to this venue, and had a good time during the investigation. Many thanks to our host for contacting Ghost Connections, and for allowing us to carry out this investigation.